Vehemently opposed to the corrupt and oppressive Empire, Alderaan's Princess Leia Organa is one of the most proactive young leaders in the Rebel Alliance. 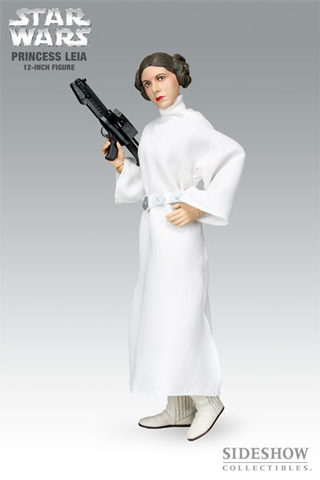 Beautiful and intelligent, Leia has made a name for herself in the Imperial Senate and has a reputation for levelheaded politics and maturity far in excess of her years. Under the cover of her diplomatic errands, the headstrong young noble carries out the work of her father and his allies, surreptitiously coordinating Rebel activity right under the noses of Coruscant's Imperial elite. The risks to both Leia and her family can hardly be understated. While Leia and her father Bail Organa, Alderaan's senator and the husband of Queen Brea, go to lengths to conceal their activities and avoid openly attacking the Emperor, their discreet opposition to his policies is known to the Empire. When the Princess is apprehended by Lord Vader on a secret mission to find lost Jedi Obi-Wan Kenobi, the Emperor's lieutenant believes he finally has the proof he needs to arrest Organa and her Rebel allies. Wily Leia, however, hides the stolen Death Star plans he seeks in a plucky astromech droid and instructs him to deliver them to Kenobi at all costs. Though thwarted, Vader nonetheless detains her as a traitor and an enemy of the Empire and attempts to extract information from her through intimidation and fear. But, with a will every bit as strong as the Sith's, Leia resists giving up the rebels, even faced with such terrible sights as the obliteration of her homeworld and her family. Leia's scheduled termination by the Imperials is also prevented when the Princess is rescued from her Death Star prison cell by Luke Skywalker, Han Solo and Chewbacca, thanks to her foresight and trust in Artoo. It would be a fateful meeting of heroes that would see unlikely friendships formed, love kindled, a scattered family reunited and ultimately, free a galaxy from tyranny.